@BifBangPow: What Happens at the Comic-Book Shop Stays There with New THE BIG BANG THEORY™ Convention Exclusive! What Happens at the Comic-Book Shop Stays There with New THE BIG BANG THEORY™ Convention Exclusive! Our special edition THE BIG BANG THEORY™ Sheldon and Stuart 3 ¾-Inch Action Figures Set of 2 - Convention Exclusive is made exclusively by Bif Bang Pow! for Entertainment Earth as a convention exclusive! In his first ever action figure, this comic book owner is sporting his sweater jacket and button down plaid shirt combo. It’s all tied nicely together with his blue jeans and not-so matching blue shoes. His theoretical physicist pal is dressed in a red alternate mathematical equation T-shirt and rounds out the look with tan pants and brown shoes. Their apparel is inspired by outfits worn by both characters from actual episodes of the series! Both figures feature 5 points of articulation at the neck, shoulders and hips. As an added bonus, the individually numbered packaging includes a fold-out diorama similar to Stuart’s comic book shop (pre getting burnt to a crisp.) 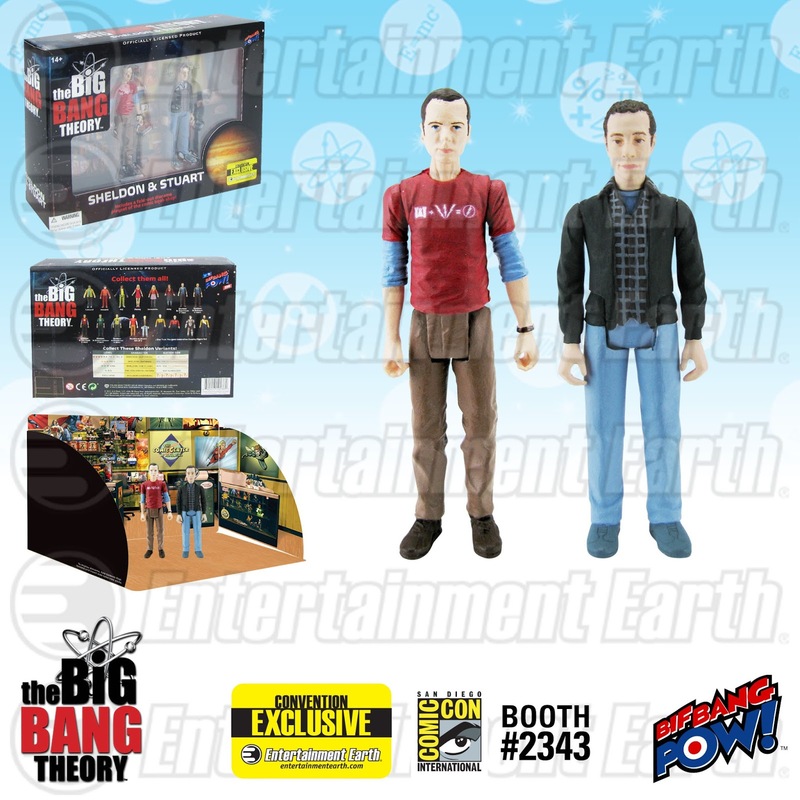 This 2 figure Entertainment Earth Convention Exclusive is a limited edition of 2,400 sets! It’s enough to make you exclaim, BAZINGA!™. Not attending San Diego Comic-Con 2015? *PRE-ORDER your The Big Bang Theory Sheldon and Stuart 3 3/4-Inch Action Figures Set of 2 - Convention Exclusive at Entertainment Earth now! See more of our The Big Bang Theory collectibles here!